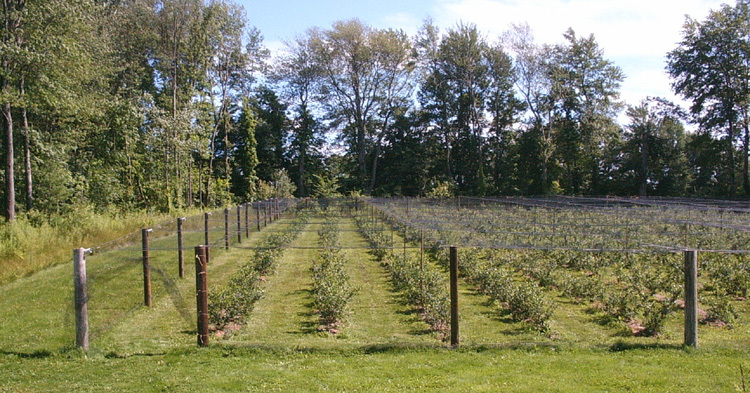 A pick your own Blueberry Farm. Our picking season starts early in July, usually around the 4th and runs through the end of the month. With a little bit of luck we might make it into the first week of August. This was our 10th year for U-pick blueberries. We hope to see all of you again out in the field. We update this website daily during the picking season. The Farm is open only on the days we post. Those days will most likely vary depending on the amount of berries ready to pick. Please use this website as a source for up-to-date picking information as well as the open/closed sign at the entrance to the parking lot. "What variety produces the sweetest berry" is a question we're often asked. Blueberries do not ripen as soon as they turn blue, but after they have been on the bush for a few days to a week. Look at the blueberries all the way around and under to be sure they are completely blue. The more blue the berry, the riper and sweeter it should be. Please check this website for daily picking information, or call the farm at 508-234-9859. We strongly recommend that you verify we are open before making a trip down to the farm. Mother nature and the number of customers determine how many berries are available on any given day. The area for our blueberry field is approx. 1 acre. We now have a total of 1025 bushes, made up of the following varieties: Duke, Reka, Patriot, Blueray, Bluecrop, Bluegold and Chandler. These varieties were selected in part to extend our picking season, since they ripen at different times during the summer.